With all the work that I’ve been doing lately I could sure use a vacation. And I know I’m not alone in this, right? If you are a mami you are forever spending your time taking care of others which is what it means to be a mami. And I’m so glad to know that my friends at Southwest Airlines recognize this. As a matter of fact we know how hard you’ve been working taking care of your family, working in and outside the home, attending school functions, chauffeuring everyone around, nursing the sick kiddos and hubby, and much more I’m sure. How you hold down the fort is a wonder but you do it every day with a smile on your face. For that, mama, Southwest Airlines wants to thank you this Mother’s Day with the chance to win two round-trip tickets that are good for any SWA destination! Can I get a WEPA?!?! Just leave a comment and tell me, as a mom, what is your favorite thing about flying Southwest? And share with us where you’d like to fly to as well! 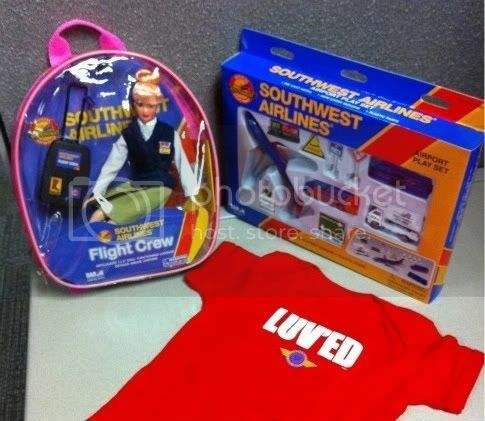 And Southwest Airlines hasn’t forgotten about the kiddos either so they are also throwing in some souvenirs (or in-flight entertainment) — a Southwest Flight Attendant Doll, an Airport Playset, and the LUV’ed onesie courtesy of Southwest Airlines. Sweet! Wait! Another Shot at Winning AND a Trip To a Spa?!?! You heard me correctly, mi gente! If you want another shot at winning the awesome team at TodaysMama.com are also giving away a pair of tickets from Southwest Airlines AND a dream getaway to the Miraval Resort and Spa. Just go here to enter! If you feel like you really need that extra push to win, don’t worry. Here are some ways to do just that. For every extra thing you do below be sure to come back here and leave a comment saying you did so with a link to it. Contest ends Friday, May 13th, 2011 at 7pm EST and Official Contest Rules can be found here. Buena Suerte – Good luck! —- This contest is now closed. We have a winner: AMY BAYLISS!!! « How Hyper is Hyper? My favorite things about flying Southwest are the inexpensive ticket prices, no baggage fees and easy on and off access. I would love to fly to the beach and relax!!!!!!! My child has paws 🙂 so I’m glad Southwest only charges $75 each way for pets ! I love Southwest’s peanuts and I’d love to visit my in-laws in West Texas. Southwest is family friendly, so helpful with children. I would like to go to Steamboat Springs, CO where my family plans on honoring our mother who tragically died in a house fire. and I would fly anywhere the sun is shining! Idaho is having a hard time catching up! Southwest seems to be one of the few airlines that provides good customer service. I’ve had fairly good experiences the last couple of times I’ve flown SW. If I won, I’d likely fly to California or Santa Fe. And I like you on FB! I’ve actually never flown on Southwest, but would love to become a new customer and go to LA to visit my friends and family. I like flying Southwest because they have the lowest fares and direct flights to my destinations. I think we’d go to Vegas if we won tickets. I LOVE the free luggage on Southwest & the fact they haven’t lost my kids yet! Hee hee hee My daughter has flown solo a few times and they’ve been WONDERFUL! I want to fly to see my sister in Denver… I’ve never been to her house and she’s lived there 6 years! Southwest has the cheapest rates! I love how helpful Southwest attendants are! And love that bags are free to fly! I’ve subscribed to your newsletter! I like the friendly service with South West! I would take my hubby on the honeymoon that never happened. I love that if you are traveling with a child you get A or B boarding! Their boarding policy is awesome! I love that Southwest lets families board while there is still room for them to sit together! Love the LACK of fees…the list goes on! I would love to fly somewhere warm and relaxing! I “liked” you on Facebook! I like their online check in. Makes it easy when traveling with kids. FLy to maybe NYC. I love that I don’t have to pay for luggage. I would go anywhere warm with my husband before he deploys in September. I love how easy Southwest makes flying with children! Thank you! I would fly to South Dakota to surprise my bff who I miss dearly. I like mami2mommy on fb! Southwest makes it easy to fly with kids and I need a vacation in a major way!!!! No baggage fees is great! I’d love to visit my sister in Miami! Our family loves southwest, bc we can pick our own seats and always get to sit together! The Flight attendants are always so friendly towards kids too! I really like not having to pay extra to check my luggage. That is a big thing to me. Having to worry about what I can or cannot bring to avoid extra cost, etc. I would really like to fly out to the Stephenie Meyer Day celebration in WA, can’t afford it and I am a really big Twilight fan. I also like you on FB! I like how relaxed and funny the flight attendants are! I would fly someplace with a nice beach! I “liked” you on fb for another chance to win Southwest tickets. I like Southwest because they don’t charge to check a bag….I would give the tickets to my parents (who live in WA state) to travel to Florida to see my 91 year old Grandpa who is not doing well. As a mom I really like the pre-boarding. With 3 boys it makes it SO less stressful! What is your favorite thing about flying Southwest? The prices! Tweeted about this awesome getaway!!! I love the Southwest staff and how kind they are about having kids and all the extra needs with them. I never feel like I am an inconvenience. I would LOVE to visit family as we have no family close. I love Southwest’s low fares!! And I would go to Milwaukee to see my cousin! I love that SW lets you take free luggage! I love flying Southwest because bag fly free, you can pick your seat, and super friendly staff! I could go on and on!!! Also, I can’t wait for the Air Tran merger with Southwest so that we can also fly to Hawaii via Southwest! It’s a dream come true!!! I ‘like’ you on Facebook!! I like their friendly service. I would fly to Pheonix Az. I love flying on Southwest because you can pick your own seat, bags fly free, flights are easy and carefree and the people are delightful. I like to fly to any place that is warm and pretty! I’ve actually never flown Southwest (since they don’t fly out of Atlanta) but would love to as they seem so kid friendly! My husband, 1 1/2 year old son, and I would probably fly to San Diego for our friend’s wedding this summer. I am flying Southwest for the first time next month! I would love to fly anywhere warm – I’ve had enough of rainy Oregon for a long time!! What I love as southwest is how friendly they are. My son was being a bit busy and one of the in flight attendants offered to walk him up the isle. He ended up walking back and forth 5 times. She was so nice and offered him a few fun things to take back to the seat. He has loved flying since! And for me it was great because I had the baby to handle on my lap and my son was just getting restless…it was a much needed walk! And where I want to go? Oh, so many places!!! I would love to go to Hawaii or Florida! Shared the giveaway on my Facebook page! I follow you on facebook under my IRL name Michelle G.
I subscribed to your newsletter! When I have flown southwest, they have given me good service. the flight attendants were helpful and friendly. I would love to fly to New York for the first time! I love the super nice flight attendants on SW and I’d go to LA to see my sister! Woohoo, girls weekend! Love flying southwest, it goes where I need to go, at a good price, and no extra charges for baggage. Would love to win tickets to go see my mother this summer, she normally comes to visit me in the winter, but couldn’t come this year, so its been awhile since I’ve seen her. 1- As a mom, what is your favorite thing about flying Southwest? Are you kidding me!? It’s convenience is number one but there are many things — “airport” – Dallas Love Field; on time flights, snacks for kids (okay, and me! ), flight attendants, pilots, shamu plane (and others! ), drink coupons (ha ha!) etc. I could go on! I’m pretty sure I left some comments/entries. But I was doing 2 sites at once. Now I’m confused! lol So I have to test if this will post automatically. Sorry! I am a Mom to 3…23 yo 19 yo and 9 yo…plus I am a grandma to a 2 year old….my favorite thing about flying Southwest? There is never a “hassel” when I fly Southwest. I would love to go home to Minnesota on Southwest!! I love the prices of Southwest! Plus the pilot came out and gave me my pin when it was my first ever flight! How wonderful! Everyone I’ve encountered that works there is amazing! And I would probably fly to Gainesville, Fl to visit some family! I am a new facebook fan! I posted this on facebook! I like their deals and low prices. I look forward to flying to Hawaii. Thanks for the giveaway! I love that they let families with small children board in the first group. Then no one gives you dirty looks for taking too long. I’ve never flown on SW, but I would love to take a trip to FL. My fave thing about flying Southwest, is the rapid rewards program! Thank you so much for the chance to win this! I’d flip out to see my brothers again! I “like” you on FB! So many airlines claim to have the best prices but they slap on baggage fees even on carry-ons! And Southwest has the FRIENDLIEST crews ever. I would go to Orlando (from AZ) this August for my brothers wedding! Getting a family of 5 there is becoming more of a struggle everyday. The thing I like about SW is their no bag fees! It saves us a bundle…or so it will when we go in August! I love the ease of boarding–makes traveling with my son so much less stressful. I’d love to fly to Charleston! My favorite thing about Southwest Air is the free luggage, and we love to fly them to visit Orlando! My favorite thing about flying on Southwest is the free baggage–2 per person! Saves so much money when you’re flying. I’d love to fly to Orange County and go to Disneyland. Love Southwest! They are the best to travel with kiddos! They are awesome!! I have never flown Southwest but have only heard great things about the airline so can’t wait to try them! I’d love to fly to California. I really like Southwest because you don’t have to pay for bags…..Seriously…when flying elsewhere I have to contemplate whether to pack diapers, or buy them when I get there because they take up a lot of room! So, that is way nice. I also love how families get to board first. I really appreciate that! I like Mami2Mommy on FB. Sorry, forgot to say where I would fly….Probably somewhere warm with my husband. We have never been on a vacation by ourselves since we have had kids. So, that would be fun! Currently my fav thing about Southwest is that they were the only airline that had a toddler-friendly toy plane last time I was at the airport! I searched during a couple of layovers for a plane that was appropriate for my toddler to play with on the plane. Southwest Airlines’ was adorable. No sharp edges, makes a cute little plane noise which isn’t too loud, and the button was easy to push. Perfect travelling toy! Besides, its hard to beat the low price and available flights. I love the pre boarding! I like their prices and the fact that their recent acquisition of AirTran means I might get to take advantage of said prices someday soon… I’d like to go to Seattle again. WE love flying southwest becasue bags fly free! Love their commercials, too. But also we like their ow prices and flights out west so we can visit our friends. Southwest has a cool bags fly free policy- I’d fly to San Francisco with my bags! I personally love the low fares that Southwest offers and have never had a bad experience flying with them. Awesome giveaway! I love the fact I don’t get charged an arm and a leg for my bags, along with the kind patient people that work at SWA! I’d love to win the tickets and go visit my BIL and SIL in Georgia! I like Mami 2 Mommy on FB! One thing I like about Southwest, is that I feel like I can get on the plane with my kids easily and quickly. I have never had a problem. I also love that I do not have to pay for my baggage. I would fly to my hometown, Philadelphia, since I have not visited in 5 years! Southwest is awesome, its all I fly, because the bags are free! and I fly alot, back and forth to see my family. My daughter is 22 months, so being able to check your bags for free is a HUGE deal! !I would love to win! My husband is in the military, and we are coming up on our 3rd anniversay. our first one was spent oceans apart, while he was serving his country in Afghanistan. We didn’t get to have a honeymoon! and I would LOVE to go to Cape Cod and just relax with him, not worrying about dinner, bath time, picking up toys, doing laundry, grocery shopping, clipping coupons…all the fun stuff of motherhood! Thank you for the chance!! PS. I liked you on FB too! I also shared on my FB! I would go to New York, I have never been there! I love Southwest because on any other airline I would normally dress in layers to save myself baggage charges, but I love that as I board Southwest I am 50lbs. lighter and cooler thanks to no bag charges. I love Southwest! They have the best prices and best service. I would go to Hawaii and visit my sister! The best thing is bags fly free. The other thing is anywhere just me and my hubby. I don’t think I’ve flown southwest before but I’m sure I’ll love them while on my way to miami! I have never been on a plane! 🙁 I hear great thing about southwest! I would love to fly to Colorado and watch a Rockies game! I love the free bags as well! I would fly to Utah to see my family. Southwest is cheaper than other airlines and no fuss! I would love to go somewhere tropical with my hubby. We never got a honeymoon and a Long overdue! I posted about you on facebook. I “liked” you on facebook. I posted about you on facebook and I subscribed to your newsfeed. Check check check!! I follow you on your feed. For our last trip, we drove one way with a relative and then flew back with Southwest. When I realized that on our flight home I’d have to haul the booster seats around the airport with along with the carry-on luggage while keeping track of two kids by myself, I was horrified! It was such a pleasant surprise when the friendly clerk checked us in and told us that we could check TWO bags each (for free) and that the booster seats could count as one of those. Getting through the airport and onto our flights (I didn’t have to mess with the boosters during our layover, either!) was so much easier than the mess I’d been dreading! Being able to check carseats/boosters as one of our TWO free checked bags makes managing the airport so much easier! I follow Mami2Mommy on Twitter. I like Mami2Mommy on Facebook. I subscribe to Mami2Mommy via RSS Feed. Thanks! As a mom, my favorite thing about flying Southwest is that I save money on our airline tickets so then I can afford to do more things with my kids on our trip. I’d like to fly to Washington, D.C! We went several years ago and absolutely LOVED it there. We desperately want to go back soon. I like the fact that southwest is friendly, timely and clean. Miraval resort in Arizona is where i wanna go! I need a getaway!! The Prices are the best! I would go to Florida. Subscribed to the RSS Feed. I at first tried subscribing via Google Reader but I guess I’m not able to…so signed up to receive the feeds via email. If I’m able to do it via GR, let me know…thanks!! I like that Southwest has reasonable prices so we can afford a seat for a carseat. I would go to saintlouis to visit my brother. love being able to sit with the kids without fear of seats being reassigned. would love to go see my mom! I miss her! now following you on FB! posted about the giveaway on FB! now subscribed to your newsletter! My favorite thing about traveling as a mother is how excited my daughter gets at takeoff. We have a big trip coming up from Atlanta to Boston, and this would be an awesome treat! I only fly SW. They are so affordable. I would fly somewhere warm and sunny. It can’t seem to stop snowing here. I love everything about Southwest! I have family in Vegas and hope to live there someday! Southwest was the first airline I took to get there and is the only one I fly when I visit! Come to think about it, I haven’t been in a while so this contest comes at a GREAT time!! LOL! i love flying southwest because they are always on time, i can choose my seat and the stewardesses are alwasy so incredibly friendly. i find my self laughing with then a lot and they are always quick to resolve any problem. if i won i would go visit my sister in alaska. i havent seen her in 5 years because i cant afford to fly out there. she is my best friend i miss her so much! To be honest, I’ve never traveled with Southwest. I’d love to fly with them to go anywhere warm with a beach! My fav thing about Southwest is their luggage policy. They keep me coming back because of that. I would like to fly home to visit my mom and brother. I follow you on Twitter now. I subscribed to your feed. I love flying Southwest because of their inexpensive fare to Denver where my in-laws live. With that said, that is most likely where we would use the flights to. When my daughter was 4 she has a traumatic eye injury that required us to see a facial trauma surgeon. We had to fly during that time and of course, we chose Southwest. Their customer care was incredible and made a very difficult time as a first time mom a little less difficult! Where would I fly? To California to see my mom! I have never flown so I dont know what I would like best about Southwest but I would love to fly to anywhere warm and sunny with a beach! I like Mami2mommy on facebook! I follow Mami2mommy on twitter! I posted “Mother’s Day Southwest Giveaway from @Mami2Mommy & @SouthwestAir http://bit.ly/k7fYF6 Pls RT #giveaway” on Twitter! I’ve never flown Southwest but now that they’re coming to the Atlanta market I’d love to give them a try. I would love to get this giveaway. We have not have a vacation for 5 years. I love to travel Southwest because they are very nice with my children and they are right over the street in th Nashville,tn airport. Makes things really easy to drop all those bags(free bags by the way), they take care of the strollers and all the extra stuff if you go with children. I have a positive experience before and their prices are unbeatable. I like leaving all the “driving” to Southwest. I just snuggle into my seat and crack open a good book let them wisk me off to my destination, which would be Denver! I really like your blog Momi2Mommy. We need all the encourage, ideas and help that you share in here. Thanks. Just added you to my Facebook “likes”! I love Southwest because they let you change your flight without a fee! And I’d go to Portland to visit friends with a new baby! posted on Facebook about the giveaway! I love to travel Southwest … they don’t only take good care of the children who fly with them, but also of adults like me who don’t fly often and need extra attention! If I won the tickets, I would use them to take my husband on a trip to California ~ we have never traveled out West. I love Southwest! It is my favorite airlines because of the rates, flyer miles, staff, and easy website! I want to take my hubby on a little vaca for all he does for me! I love Southwest airlines prices and flexibility. And I’m dreaming of a sunny holiday…Miami or Cancun please! I love Southwest because they are so funny and friendly! Would love to go back to Disney world with my daughter. Southwest has no extra baggage fees! I would fly somewhere with my hubby for our 10th anniversary in June! Southwest takes me where I want to be. When it is cold and snowy here. I want to be near the beach. Flying with your family is always a plus. I follow you via facebook and twitter. Liked you on facebook! Glad to find this blog! Kristi likes TodaysMama and http://www.mami2mommy.com.. I love the no baggage fees! Just posted on fb about the giveaway! Southwest reminds me of fun family memories, because it’s the airline we always flew. 🙂 My husband and I would like to go back to Washington D.C. Thanks for hosting this giveaway! Just subscribed to rss feed…. I love how fast the SWA check-in lines are, especially if you have baggage. I follow you on reader. Southwest makes me happy b/c they still let families get on between the A and B group, which means that even without reserved seating we all sit together. Yeah! I’d take a trip to Albany, NY for a girls’ reunion. I like to fly Southwest; their attendants are fun! There are a couple of places I’d like to visit. If I win, I’ll have to prioritize! My husband and I could use a getaway. Love the prices and no fee for baggage…thats huge when you are packing for a baby too! I would LOVE to go visit family! Thanks for the chance! Posted about this on FB! Added you to my Google reader! I subscribed to your RSS feed. I’ve never flown on Southwest but would love to try it out! I love that Southwest has two free check-ins and that their flight attendants are usually pretty funny. The fares are the best! Great destinations! Hi Jennifer, I just found you from TodaysMama. Oh’ this is such a cool giveaway! My son is grown but I would guess the best thing would be not paying extra for luggage. I would love to go to Carmel, CA or perhaps to the New England area. I’d just like to get away. I’m not picky – ha-ha. I’m now a twitter follower too. I just liked you on facebook Jennifer! I also am a new subscriber via email. I’m a new follower on GFC as tonasun. It’s been ages since I’ve flown on Southwest, but I do recall how efficient they were. They took care of my business in a polite and practical manner b/c they knew I had other things to do besides get slowed down with overly-friendly formalities. If I were to win the tickets, I’d fly my husband to Cancun and relive our honeymoon which took place nearly 21 years ago! I love being able to check a bag for free. Babies=lots of stuff! Oops, forgot to say where I would go….Arizona maybe! Can you delete my first comment? I don’t want to have entered too many times! And I love free baggage! Babies=lots of stuff! The prices – San Francisco! I like that Southwest takes me away! I would love to go someplace warm and sunny…away from cold, rainy NY! This month my husband and I celebrate our 10th wedding anniversary, so this trip could do double duty as a Mother’s Day/Anniversary trip! As a mom, I love that Southwest makes flying affordable and fun. I love the roomy seats and the free luggage on Southwest. I would visit my Grandchildren which I only get to see once or twice a year. I liked mami2mommy on facebook. I hear Southwest has free luggage, great prices and roomy seats – sounds great to me! If I win, I’d fly to a big city like Seattle or New York. It would be a great escape from my little Florida beach town. As a mom of three grown children and four grandchildren who all live out of state, I appreciate Southwest’s getting me safely to visit them. I just visited my daughter and youngest grandchild a few weeks ago on Southwest, and if I win this giveaway I’d use the tickets to visit the rest. Thanks for the great giveaway! One thing I like best about Southewest is their prices. I would use the tickets to go to California. We are getting my stepdaughters this summer and havent seen them in over a year and we are taking them to Disney! I haven’t seen my mom who is 82 in over a year. I would head for home. (Massachusetts) Love Southwest for the ease of booking online and no baggage fees! I love to pick my own seat – and I’d be so happy to head to California for a little vacation! Fav thing about SW is no baggage fees so I can check the bags and not haul carryons and kids around! I’d so fly to see my sister who is expecting her first on the east coast! I would love to go anywhere WARM! Winter has been long up here this year. I’d be glad to fly anywhere with Southwest. They have such great customer service! I love that Southwest does not charge for checking luggage! They are also usually really helpful with my son (giving treats and activities). and I liked your blog on FB. I love that southwest is usually cheaper AND you don’t have to pay for baggage. I think we’d head from Texas to South Carolina to visit the family. I love SWA’s customer service. They are great on the internet, phone and when flying. I would love to fly to AZ to see my best friend! I’ve never actually flown Southwest but have always heard great things about them and would love to give them a try. I would fly home to Seattle to visit friends and family. I love flying Southwest because the tickets are always the cheapest. I’d fly to Hawaii because I haven’t ever been! What’s not to love about free bags and flying from an airport 15 minutes from home?? I would go to New England. I love that Southwest doesn’t charge for baggage! I would visit familyin Ohio or vacation at Outer Banks! My favorite thing about Southwest is how easy they make it to change tickets… My hubby travels a lot and SW is always great at allowing him to switch flights around so he can come home sooner if he’s able. If I won the tickets I would use them to fly out to Florida to meet my husbands family that I haven’t been able to meet yet. His family is from Cuba and I’d really love to meet them, especially his grandmother! I love to fly Southwest because No baggage Fees, and great rates! I plan on driving to Hunstville, AL from GA this SEptember so that I can Fly Southwest to San Diego! I can not wait till Southwest is here in the ATL, but untill then they are worth the drive!!! I have never flown Southwest, but I hear they have great customer care and exceptional prices. I love southwest because you don’t have to pay for bags! i would go anywhere warm! I love how easy breezy it is to fly Southwest. No bag fees, consistently good fares, and generally on time flights. What’s not to love! As for where I’d like to fly, hmmmm. Likely to New Orleans for a relatives wedding next Spring. I love Southwest because they have no baggage fees. That makes a big difference when you’re flying 3 kids with you! I would fly to somewhere with a warm beach! I love how simple Southwest makes it – free bags, easy boarding, cheap fares. Just liked you on facebook! I love that Southwest flies to Seattle. I would like to visit my best friend. Thanks for sharing this great giveaway! SW customer service is FANTASTIC!! Love them. I’d fly to Salt Lake City. On my list of places to visit! So many airlines claim that they have the cheapest fares, but watch out – because they slap on baggage fees even on carry-ons. This is one of the reason why I choose Southwest Airlines. Plus – Southwest has the friendliest crews! Thanks for an awesome contest! No extra fees.. free baggage great reasons to love Southwest! I love flying, makes me feel like a little kid again!! I liked you on Facebook!! I liked Mami2Mommy on Facebook! What a giveaway!!! My favorite thing about flying Southwest is that I feel that I’m supporting a “local” airline, the great prices and the free baggage check-in! I would hope to fly to California! I liked Mami 2 Mommy on facebook! SW has the most amazing employees – they really do care about customer service. I love free baggage! I hate trying to carry-on with little kids just to say $50. LOVE LOVE the no bag fee !!! I also love the great service we get! I love that Southwest does not charge baggage fees. I would fly to Florida to go on a cruise! I love how friendly, courteous and prompt all the staff and service always is whenever I fly Southwest. If I win I would love to go somewhere warm with my husband, and no kids!! I love that they are so affordable. I’m planning a trip to Vegas so I would fly there! I love that Southwest doesn’t have any hidden fees and is affordable. I would fly somewhere I have never been with just my husband, no kids. I love flying South West because as a Mommy, they have been very accommodating to me and my baby and either allow me to have extra room or help assist me. I would love to be able to go to Sacramento to visit my own Mom and have her see her grand baby! I have always had child-friendly experiences with Southwest. I flew quite a lot with my oldest and several times he got to meet the pilot. Now I have four little ones so I don’t travel that much these days! At Miraval I think I would most enjoy the peace and quiet — oh, and a massage! I love Southwest for their great fares, and I would fly to Arizona. I love their customer service! No baggage fiees plus they always take such good care of me! I’d fly home to see my parents so they can meet their grandson for the first time! No baggage fees. I don’t know where I’d go. Someplace sunny for sure! I love southwest Airlines because of their amazing staff. They are incredibly warm, cheerful, and accommodating. I would definitely fly to California to see my brother who has never met his only nephew! It’s hard to pick just one thing. I love that they fly direct to many places, that they’re quick and efficient and hardly ever delayed, and that when our kids fly free, they can have their own seat if there’s enough room on the plane. Good stuff. We’re planning an actual family vacation this year, the first for just us as a family, and we’d use the tickets for that. I love Southwest prices and their always friendly flight attendants. I would love to fly to the east coast somewhere and explore with my hubby for our anniversary! And I would absolutely love to fly as close to Aiken, SC as I can get. I’ve got a new little nephew there that I’m DYING to see! I like free baggage, and just everything being simple and easy. I would fly somewhere with my husband for our 10-year anniversary. We love to fly SouthWest…they are great and CHEAP!!! Yay!! Thanks! I’d love to fly to KS or MI to visit my dearest girlfriends!! I liked you on FB @ kari.schmidt1 Thanks!! I love that Southwest doesn’t charge you to check your bags. I would like to fly to the NE somewhere. Oh, I sooo need this! As a mom, my favorite things about SW: great fares, no fees for luggage and it has flights from Tampa International to many of my favorite destinations. If I win, I’d go visit family in NJ/NY or…pick a random (cool) spot to be alone…ahhh. I like to fly southwest because of their prices and great service. If I won, I would fly to Southern California to see my sweet grandkids! There are several reasons I love Southwest Airlines. 1. The folks who work for Southwest Airlines are all good people and funny too. 3. They don’t nickel and dime their customers for extra fees…first 2 bags fly for free. 4. Customers are their number 1 priority. 5. Small fee for WIFI. 6. The new rapid rewards program is terrific. I would fly from Orlando to Seattle. We made the move from Seattle 7 years ago and miss the great Northwest terribly. My favorite thing about southwest is that I can pick my own seat. When I fly by myself with my FOUR kids under SIX no one wants to sit by me so we usually have the rows to ourselves. Also LOVE that they let you take two bags for free. That is HUGE for me!! I also signed up for your RSS Feed! I love flying Southwest because they have great snacks. I love the Business Select option, letting you bypass long security lines and board early, no matter when you check in! We love flying Southwest because they are so affordable and family friendly — both make a huge difference when we are travelling with our toddler son. Please choose us for the tickets and help us get some much-needed R&R! We recently moved and are on a budget, so it would make a huge difference for our family to be able to afford a vacation. My favorite thing about flying Southwest is affordable rates without sacrificing customer service. I would probably fly to see family, or maybe to meet one of the great online friends I’ve made over the last several years. Southwest is hands down my favorite airline. Cheap fares, great service, no extra baggage fees, always on time and good rewards program. I would fly to So.California to visit my sister. I would love to fly to Texas to visit my brother and his family whom we don’t get to see often. As a mom I love that you are not charged extra for bags. For only having an infant the little guy sure does come with a lot of baggage. Ha! As a family we would most likely head to L. A. to visit loved ones. I appreciate that there are no bag fees for first couple of bags. I could definitely use this for upcoming blog conference trips! As a mother in a mixed family (I have 2 children from my first marriage & a step son from my husband’s first marriage) we do a lot of long distance traveling. For my step son’s last 3 trips out to visit us, he’s been flying as a unaccompanied minor on Southwest. He has always arrived safe & sound and they have good steps in place to ensure he gets to the person who is supposed to be picking him up (as opposed to some stranger). Love southwest’s laid back/ kind attitude. Would LOVE to fly to somewhere (anywhere!) warmer than home in late spring! To win would be sweet~ sweet! I love that southwest is family friendly! They do everything they can to make our travel fun and enjoyable! I would use the tickets to visit my family in CA whom we all miss terribly and only see about once a year! I like to fly Southwest everyone was so friendly and made you feel at home, but its has been a while since I have gone anywhere. Love your slogan “Just Plane fun” that is what I really need right now. I have family in New York, California and Florida so any of those three destinations would be great. Happy Mother’s Day to all! There are quite a few things I enjoy about flying Southwest. We have used their services many times to visit family Washington state. Unfortunately, because Southwest does not fly everywhere I have also had to use other airlines so I can comfortably compare. Southwest wins hands down for customer service and a clean atmosphere. Boarding is easy and I applaud them for not charging ridiculous amounts of money for baggage. When you are traveling with four kids it can be quite challenging but the employees at SW have gone out of their way to make me and my kids feel comfortable. They check on us often, bring small pillows and blankets, and one or two have even stopped long enough to be entertained by the jokes of a 9-year-old. That makes it all worth it to me. I “like” you on Facebook. 🙂 Thanks for the opportunity! I love that the attendants were so helpful when I traveled alone with my 13 month old daughter! I would probably go visit the east coast, never been there! I like Mami 2 mommy on facebook! Shared the giveaway on Facebook! I love that Southwest flies so cheap to many places with free baggage! I want to check out Portland. I’ve heard it’s a beautiful place with artsy happenings. No baggage fees – that really adds up! We would take a family vacation to Disney or a long adult weekend in Vegas! I like the boarding system that allows me to pick the best place for my children to sit so they won’t disturb others. It makes it so much easier as a parent not having to worry about if my daughter is going to get to sit next to the window and if my husband will be seated close by or if we are all going to be split up on different ends of the plane! I’d love to take the family to Santa Barbara and show them the Pacific! Southwest is my favorite airline to fly for several reasons: their customer service is friendlier and more helpful than other airlines, the flight attendants are friendlier and make flying more fun, their fares are more affordable and they don’t charge for checked bags! Bottom line: SW really cares for their customers!! I have a child with special needs and it is much less intimidating and more pleasant to fly SW than anyone else. Southwest is friendly and helpful great for family travels. The resort and spa trip would be nice for some R&R and very belated honeymoon would love a message too. I like Southwest because of their affordable flights! I would fly to visit my brother in LA who I’ve never visited out there before. I “liked” Mami2Mommy on Facebook! I love the no baggage fee! And I would use it to fly to Seattle for a girls weekend in August! Thanks for such an awesome giveaway! I love that there are no charges for bags, and customer service is always great!! 🙂 We want to visit family in Indiana for the holidays!! My favorite thing about SW is there prices are pretty low compared to others. I would love to go home and see my family in AZ. I love that on Southwest bags fly free! I’d go somewhere warm!! Holy cow I am loving this giveaway!!! My favorite thing about Southwest is the cheap flights and that there is no charge for bags. And in the past 2 years, only 1 of my flights has been late. Not to shabby!!!! Oops and I forgot to mention I would love to go to Utah to see family or California to see my other family!!! whoops missed the first entry: I love flying, I’ve been on southwestern a bunch and love how clean it always is…as a mom that’s VERY important to me! Hmmm…where would I go, how about Vegas! –thats where my husband would want to go and I’d love to see the grand canyon! I love the no charge for bag fee too! Traveling with kids you need STUFF! I already like Mami 2 Mommy on FB and follow you on twitter…does that count??? I would have to say the cheap fares would be my favorite thing about flying sw. I love to flysouthwest cause of the no bag fees. I would love to fly to los angles because I have not seen my best friend in over 7 years and it would be awesome to go see her and spend sometime out there since I have never been. I love family boarding!!! I never have to worry about checking in early. Thanks! PS– I want to fly to Arizona! Following you on FB! I’m Michelle Sweepstakesgirl! I love, love that Southwest allows one free suitcase per person and that they have family priority boarding. I always choose Southwest when it´s an option. Just the suitcase alone saves me $50 or more on a trip! I follow you on Twitter for a long, long time! My mom loves flying Southwest because all the employees are SOOO nice and really enjoy their jobs! Along with not having to pay for bag fees and so many flight options, it’s the only way to fly! I like SouthWest because is affordable and because I can make online booking very fast since their site is very easy to navigate. I would love to go to New York, I went once for one day and I’d like to spend more time in that beautiful city. My favorite thing about SW Airlines is the cheap fares! I’d like to fly to New Mexico this summer. I love flying southwest because they are so very accommodating to families with young children and everyone is professional. I like southwest because of their corporate culture and laid back style. Also no bag fees and no BS pricing. I love Southwest because their service is excellent! I’d love to visit family in Texas. I would have to say SWA free baggage check is fabulous! Havig a family with 3 girls this is a must. We would love to fly to Panama City Beach FL to see grandparents. Thank you, Happy Mother’s Day! No baggage fees! I’d go to someplace relaxing and warm! Man alive, I want to win this. & who wouldn’t? The souvenirs are really just the icing on the already awesome cake! I liked Mami2Mommy on FB! I am getting your updates in my Google reader now. So glad I’ve found you! I have never flown SW so I would love the opportunity to see for myself how great they are to fly. My husband and I would take a honeymoon to Isla Mujeres if I won. We got married in 2009 and still have not had the opportunity to have a honeymoon. I’ve never taken my kids on a plane before but I think it’d be nice to be as comfortable on the plane with them as I’ve experience flying SW solo. As for where we’d go…probably Washington DC, my brother lives there and we’ve never been so to go sight see and visit family would be fantastic. As a mom, I love the ease and convenience of flying Southwest. From boarding to the on-flight services by awesome flight attendants, they make traveling great! If I won these tickets, I would fly to my inlaws home across the country so I can properly introduce their 1st grandchild to them, including introducing our daughter to her great-grandmother. I would fly to Chicago! I fly SWA whenever possible because their fares are so affordable! No charge for checking bags, no charge for changing tickets, and you can board earlier with kids. Love Southwest!! I would go to San Francisco. As a mom, I like flying Southwest b/c the seats are clean, and children can board early. I also like that there is no baggage charge. I would fly to Alabama to see my family that I haven’t seen in 3 years. I liked you on FB! And tweeted the offer, and subscribed to the RSS feed. Can’t wait to start following you! I would fly to San Diego to see my family! i like the way southwest tickets! i don’t know where i’d go…i haven’t had a vacation since 2006 so it would take a while to decide!!! i just liked you on fb! We fly Southwest because it’s more affordable. And we’re grateful for that. If I won, I’d either choose Portland, Oregon; New York, New York; or New Orleans. I love their great fares! I love the smiles from the staff at Southwest. Yes, the rates are good but they could up the prices for the smiles and nice service – FOR REAL! Where would I fly? Um, where are you sending me? Seriously I would love to go to California and explore the vineyards and have some lovey dovey time with the hubby! That would make me a better mama! Subscribed to you via RSS! I like to fly SWA because it is such a fun atmosphere. It is stressful to travel with kids, so the laughs the flight attendants offer are very welcome!! I love flying SWA because the flight attendants always make me laugh. I’d love to take my son to Southern California or Florida to enjoy an amusement park. Thanks for the giveaway. I would love to go with my son to Washington State to visit my family! I follow via Twitter at Living_LaLaLand! I like Mami2Mommy on Facebook:ChacoyAguayo/Livinginlalaland! As a mom, I appreciate to large variety of flights Southwest offers from the Chicagoland area! I would love to fly to Hawaii!!! I love to fly Southwest because they are always so helpful & nice. My family could really use a vacation…..to the beach or even to Disney World! I a fan on facebook!! I signed up to recieve your emails!! Love Southwest b/c they are the friendliest flight crews!! I liked you/this on facebook as well!! Thank you! Oh! I would fly to visit my family, we are all scattered about the country and rarely get to see one another. I actually haven’t flown anywhere since my first wedding anniversary 6 years ago. But I hear Southwest doesn’t charge for bags. I would love for my husband and I to take a trip somewhere fun like New York! i am not a mom, but i love flying because of their customer service! i want to fly to new york! I love flying southwest because there are no baggagge fees. I love Southwest Prices! I’d love to fly to Hawaii! I love their prices and their free bags. I would head to Florida for some relaxation! I have never been on a airplane and would love the opportunity to. I would love to take my children to Arizona and stay at Miraval. I have never been to Arizona but has heard it is amazing and just to be able to spend quality time with the kids at Miraval is priceless. I LOVE Southwest because they are so entertaining and relaxed. And they don’t charge for baggage! I would LOVE to win this because my husband is in Illinois until September (we live in Utah) and I’m pregnant. I would love to meet up with him and enjoy a few days together! My favorite part of flying Southwest is how accommodating and friendly the staff is. As a mom, my FAVORITE thing about flying Southwest (which we just did in March to Orlando) is how they treat the children on the flight! They gave my sons extra snacks and came by with special activity packets, complete with “wings”. They were super nice to them, which always rates high with me!!! P.S. I would fly anywhere with my husband…Our older son was born on our anniversary and our younger son was born on Valentine’s Day, so we never get to celebrate a “romantic” holiday as we are always celebrating their birthdays. We always say we will celebrate at a later date and then never do. This would be the ultimate way to relax together and celebrate both Valentine’s Day AND our anniversary (coming up on May 23) this year!!! Thank you! I love their affordablity, I would love to take my husband to Vegas he has never been. Love that SW is on time. And I’d love to go to California! I love traveling Southwest with my family because we can pick the seats we want and can sit together! And I’d go to Florida! I like Southwest because they include baggage handling fees and because their flight attendants joke around and make traveling a bit more fun. If I won, I would fly to Dallas to see my aging parents who aren’t doing too well. Thanks for the chance. i have flown so many times with my kids. i feel like most flight attendants are annoyed when they see a mom with not only one kid, but two. i get a little nervous and start sweating immediately. by the end of the flight, no matter the length, i am exhausted trying to keep my kids from being a “nuisance” in the eyes of the flight attendants. However with SWA I do not feel this pressure. When flying solo without my husband, they take extra special care of moms. They cater to the kids and keep them occupied with special toys and always make the kids feel welcomed. One flight attendant has held my baby while I took the toddler to the potty. No way we were all three fitting in that tiny toilet! i would love to go to sunny florida. i need to feel the warm sun on my skin and the hot sand in between my toes! I love SWA because the flight attendants have always been so helpful with me and my son. I travel alot with just my son and they always try to help & keep him busy. I am now pregnant with #2 and won’t fly with any other airlines because of their great service with kids! I like that southwest used to be (I don’t know if they still are) first come first serve. You get a better seat if you are early. If I could fly anywhere, I would go to Hawaii. But I don’t get around much so I would probably go anywhere. #1 entry – I love that you get to take 2 bags and a carry-on for free. That’s how it should always be! I traveled once with Southwest when my twins were 8 months. They went above and beyond to make our travel easy. They even informed us of extra seats without us even asking so that our kids could fly in their own seats! I love the friendly and FUNNY pilots who fly Southwest airlines, and who can beat their prices, especially when flying with kids? I would love to visit family in KY! As a mom, I think I would like to fly out to Florida so the fam could do something fun – with no luggage fees. I love that they are family oriented and I’ve never had once person be disagreeable; the customer service is great! I shared on Twitter and Facebook. I’ve only flown once, when I was 5 & no idea what airline. If I won though, I’d use them for Orlando, Fl. Our dance nationals are there & that would really help me out a lot! 1. Southwest makes check in and boarding hassle free a must have with kids. And their true customer spirit values are apparent. 2. Anywhere warm I miss the sun! Southwest Airlines makes it so easy to book tickets online. Great prices and no frills to pay for. I like how they will give you a free seat for an under 2 year old if available. I would fly to LA to see some old friends! I love that Southwest doesn’t charge for checked bags. I’d probably fly to Orlando to visit my aunt. I’m subscribed to your newsletter. Wednesday is here! Have a great day. I’ve never flown with Southwest before. But I’d love the chance to take my family to Washington, DC. We’ve been talking about going for a while! I like the friendly employees and the cheap ticket prices. I’d head for New York City if I won. Love to travel Southwest because they make it so much EASIER! I love to fly Southwest. They are so accommodating when I need things for the kiddos and are always friendly! My favorite thing about flying southwest being a mom is how kind they staff is! I had to fly with an infant twice in 6 months for Bereavement flights and they were super helpful in getting me from point A to point B with an infant during the difficult times. I would love to fly to Florida and visit my daughter and son-in-law and my grandchildren. They are out of the country right now in Honduras. They will only be here (in Florida) for a short time and then they leave again. I would really like to fly there to see them on Southwest Airlines because of their excellent customer service! Subscribed to your rss feed through feedburner. My favorite thing about flying Southwest is how helpful and friendly the flight attendants are to help ensure that I have a pleasant flight. I would love to fly to San Diego. I Subscribe to Mami2Mommy newsletters by email. I love how FRIENDLY SW is. Always! I think we might fly to Montana or Maine. Somewhere we’ve never been together! I would love to win! I “like” you guys! I def need a vacation! I have a 17mo old who is nonstop going! A little me time would be awesome! WOuld love to win these tickets to have a special time with my mom that I havent seen in a while since I am been in Brazil as a missionary..and the plus is a love southwest. I love to fly on Southwest with my kids because there is no hassle. And Southwest goes to a lot of my favorite destinations. If I won, I’d go to San Diego! I liked you on Facebook. Thanks for the chance to win! I follow you on Twitter! Thanks. I love how laid back SW is with children…although we try and be as courteous as possible to other passengers a two year old is bound to make some noise, but we never feel like we’re not welcome with SW! My favorite destination is NOLA so much to see and do and many surrounding towns to play at! Southwest always seems to have such friendly employees & I love that bags are free – I can never seem to pack lightly enough for just a carry-on!! I think we would probably head East to visit friends & family. Thanks for the chance! I would love to go to PHX to see my sisters and my newest niece (born last week!). Thanks! My favorite thing about Southwest as a mom is they make it affordable to getaway when I need to! finally Friday..have a great weekend. Son-in-law is on a 300 mile bike ride to raise monies and awareness for HIV research. We are all going out to support him.